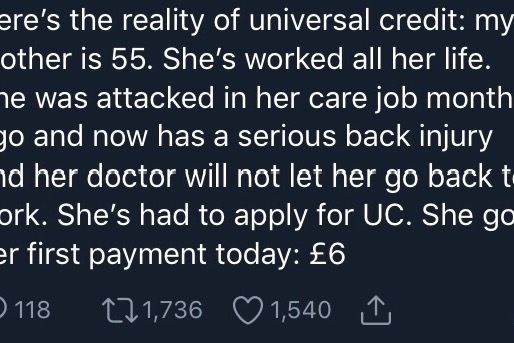 Here’s the reality of universal credit: my mother is 55. She’s worked all her life. She was attacked in her care job months ago and now has a serious back injury and her doctor will not let her go back to work. She’s had to apply for UC. She got her first payment today: £6. The woman in the job centre told her to cancel her life and house insurance, even though she has cancelled everything including TV license, phone, internet, and bills. She tried to give my mum a leaflet on how to budget £6 for the month. My mum burst into tears, and told the woman it was insulting, and left. She’s now sitting at home with no telly, no internet, nothing but the four walls to look at. No fuel so she can get out of her rural village. Her grown daughters are having to buy her food. She’s going to fall into arrears with all her bills. She cannot work right now. She can’t even get out to socialise and see her family. Can’t afford the heating. She is broken. My mother is a proud woman and would never ask for help, so I am doing it on her behalf. If you can spare £1 right now it would make all the difference to her until I can help her get this met sorted. I don’t quite know what to say. Wow, thank you everyone. I’m completely humbled by the generosity of strangers. We should not have to rely on one another to pick up the pieces, but I am eternally grateful there are so many good people out there who will step in. Thank you from the bottom of my heart, our hearts. You have all done a wonderful thing.